← How To Make Creamy Ice Cream with Just One Ingredient! Homemade baked goods deserve a pretty presentation. Try one of these DIY packaging ideas for your next Christmas gift. A homemade gift, created in the kitchen and presented prettily, is truly a joy to give or receive. 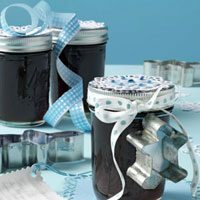 From snack mixes to candies to mini Bundt cakes and more, these homemade treasures deliver a taste of the holidays. Cheerful DIY packaging ideas add another touch of thoughtfulness to the treats. Ginger cookies are holiday hits. Tuck them into clean, recycled coffee cans wrapped in decorative paper. With a glue gun, add ribbon or trim. HOW TO: Recycled Coffee Can: This one’s easy. Simply wrap a coffee can and its lid with holiday wrapping paper. Attach a vivid-colored rick-rack trim or ribbon around the lid. Tie it all together with a wide bow. Little luxuries deserve an elegant presentation. Decadent truffles cradled in mini paper cups are the perfect gift for a girlfriend. And the charming basket-weave box top? piece of cake. HOW TO: Basket-Weave Lid: Cut light-green strips of ribbon just long enough to wrap around and slightly inside the lid of a gift box. Secure the ends of the ribbon to the inside of the lid with a hot glue gun. 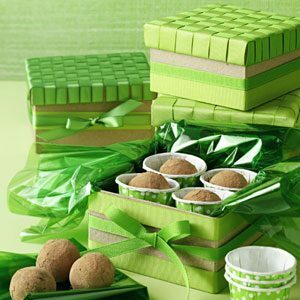 Cover lid completely with light-green ribbons, then weave deeper green ribbons between the light-green ribbons to achieve a lattice effect. Glue ends in place. Get ready for a new family favorite—like brittle, but better. 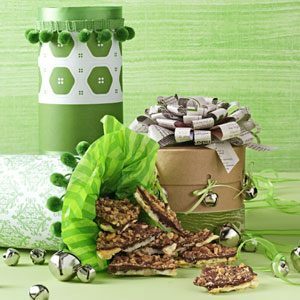 Pack pieces of sweet-and-salty treasures in decorated cardboard gift tubes or recycled oatmeal containers wrapped with decorative paper (or use scraps of self-adhesive wallpaper). Trim with green pompom fringe. 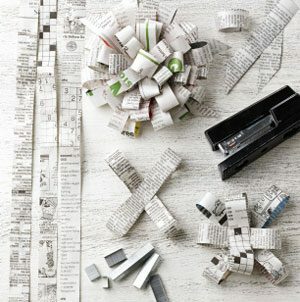 Make it fun by adding a bow made from newspaper. HOW TO: Newspaper Bow: Cut newspaper strips into desired width and various lengths. Form loops by folding ends of strip inward toward the center of strip; staple. 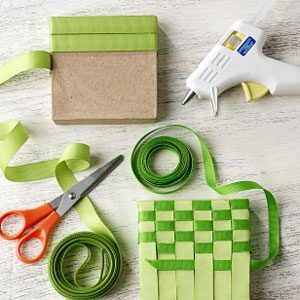 Create small, medium and large looped strips; staple similar size strips together into an X shape. Stack X’s, longest to smallest, on top of each other in alternating directions; staple together in center. Make one small loop and glue into center to hide staples and complete bow. Rosette ribbons become mini serving platters for individual Christmas cakes. Wrap them up in a see-through cellophane bag and finish with a twine bow and a gift tag. HOW TO Mini Cake Stand: Start with an “award” rosette from a hobby shop as a base. 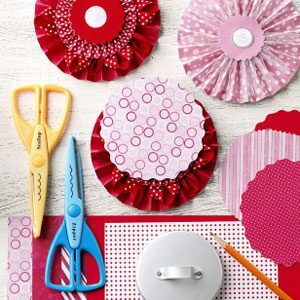 Cut slightly smaller circles out of colorful scrapbooking paper with patterned-edge scissors. Apply the paper circles to the back side of the rosette and secure with a dab of glue. 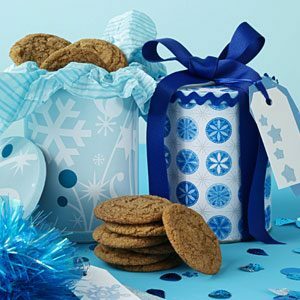 Pack this easy-to-make munchie in a sleek glass or acrylic canister adorned with cotton yarn, and it’ll be ready to put under the tree. 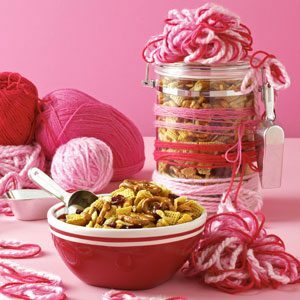 Get that candy-cane brightness by winding yarn in shades of red and pink around the canister before topping with a handmade pompom. 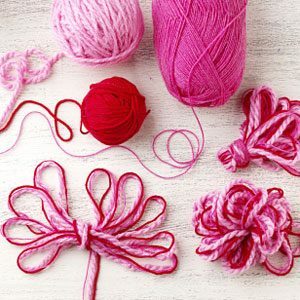 HOW TO PomPom: Line up a trio of yarn—red, fuchsia and pink—and create a dozen or so casual loops; wrap tail of yarn around center twice. Gather the loops and fold upward, wrapping the tail of the yarn around the base and tying off. Adhere to package. 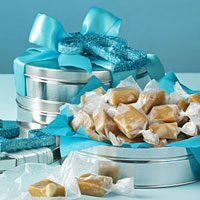 Individually wrapped in waxed paper, these chewy bites make sweet gifts. Add them to a cookie tin lined with tissue paper. Tie with a wide satin ribbon and personalize with a sparkly initial made by brushing glue and sprinkling glitter on a wooden letter. Granola goes glam when stowed in a see-through container decked out with tinsel. Nuts, dried fruit and more make a crunchy mix for topping oatmeal or eating by the handful. Tie on mini holiday bulbs fancied up with a metallic paint pen. Spread good tidings with aromatic preserves. Adorn lids with small paper doilies and snowflake stickers and tie on gingerbread man cookie cutters backed with cheery paper. Don’t forget the recipe! Bourbon adds bite to this holiday standby, packed in a small heavy-duty glass storage container with a tightfitting lid. 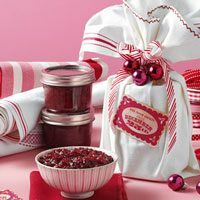 Wrap in a vintage tea towel or cloth napkin, cinch with ribbon and adorn with small ornaments. Cider, cognac and pistachios provide new flavor to a classic. 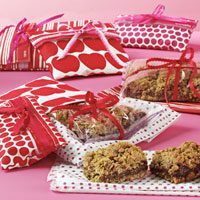 Cut into squares and place in a plastic sandwich bag, then bundle in tissue paper and slip into a reusable fabric sandwich bag tied with a ribbon. Paper bakery boxes lined with creatively cut tissue paper give these coffeehouse favorites a casual look. 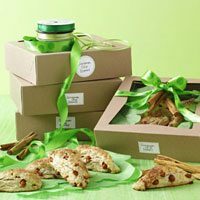 Dress up a box with polka-dot ribbon and a trio of fresh cinnamon sticks tied within a bow—their aroma is a clue to the treasures inside. A welcome warm-up in winter, this comforting blend of seasonal spices and tea in a glass sugar shaker is as easy to make as it is to give. 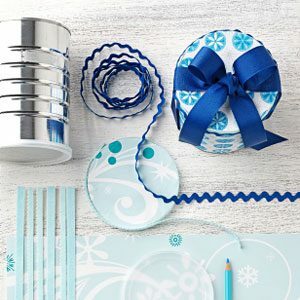 Simply encircle the shaker with two bands of self-adhesive ribbon. 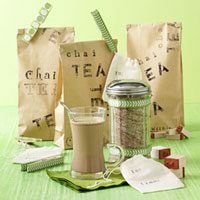 Place in a stamped brown paper lunch bag and clip shut with a wooden clothespin wrapped with the same tape.